I like quiet. I can retreat into my own head for hours. I'm excellent company for myself--I always agree with what I have to say, and when talking to myself, I'm a brilliant conversationalist. 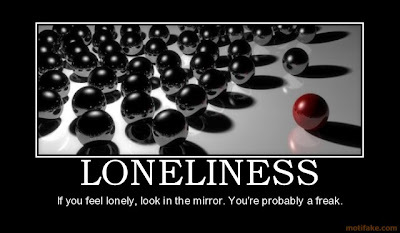 This week, though, I have a case of the lonelies. Last week I was surrounded by people 24/7. There was always someone to talk to. And not just anyone--I was surrounded by people I genuinely like and find endlessly interesting to talk to. And now I'm alone again*, and finding that the company of myself just doesn't measure up to the company of others like it had before. I'm not sure what to do with this--this wanting people around. It's new to me. Anyone want to come visit? *If anyone says, "But you're not alone! You have the kids!" I'll hunt you down and punch you in the throat. What happens in Vegas really does stay in Vegas. Midnight in the garden of drag queen bingo. Ribbed, for her (birthday party) pleasure. What I'd do for free ice cream.